Shedding is something that comes with the territory. 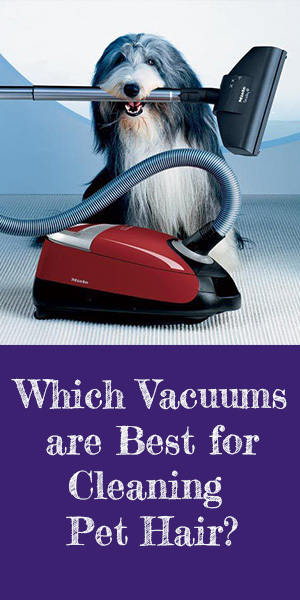 A pet parent’s vacuum cleaner is one of the most important household appliances. But what if you could clean up the hair before it left your pet? Shampoos, brushes and treatments can all help to minimize shedding, but one of the best ways to keep hair-shed under control is by brushing your pet with a specialized pet hair removal glove. By stroking your pet with a grooming glove or mitt, you can train them to enjoy the relaxing massage, whilst gathering all that irritating loose hair at the same time. There are a few different types of pet hair removal gloves out there, so we have put together a list of the best ones. Why use a pet hair removal glove? Some pets can be very intimidated by brushes. Unfortunately, you still need to use them if your pet has long or tangle-prone hair. However, using a glove or mitt in between brushes might help your pet to associate grooming with something more enjoyable. By using a pet hair removal glove, your pet will most likely think that you are just treating them to some relaxing attention, and not coming at them with a scary-looking tool! Pet gloves are designed to slide over the coat, grabbing and picking up loose or almost-loose hair as you go. You might find that you can get into sensitive places such as the legs and under the neck with the glove as it offers a gentler and more personal touch than a scratchy brush. Brushing your pet with a “hand-like” tool can also really help to keep the coat healthy, as it distributes healthy oils while removing irritating dust or dirt particles. Another great benefit to pet gloves is that many brands can also be used on furniture. Easier than getting out the vacuum cleaner, you can give the couch and chairs a good brush-down after your pet-groom to keep the hair at bay in between deep cleans. What type of gloves are there and which one should you choose? Are you dealing with long hair or short hair? Do you want to use a glove or mitt during bath time? What price-point are you aiming for? Do you want to use the glove on your furniture, too? Are there multiple pets you need to groom? Do you want to brush with both hands or just one? Here are some of the best pet hair removal gloves on the market. Some pets hate brushes because the prongs pull and yank at their hair, so a glove or mitt with prongs will only result in the same aversion. A good solution is to choose a glove or mitt which has ridges or tips which massage and capture hair, but don’t pull or get stuck. The True Touch gloves are a great choice for gentle, efficient pet grooming. The silicon tips massage the pet as you stroke, but gather and grab loose hair at the same time. This is an affordable choice. 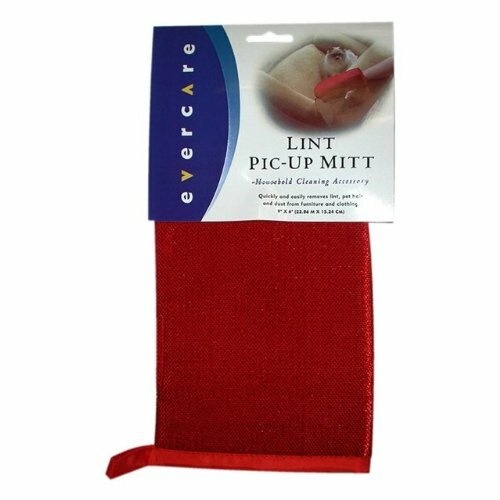 If you’re after a glove to use as the “interim grooming tool” in between more vigorous brushes, then a soft-fabric mitt is a good place to start. These mitts are specially designed for pet grooming and furniture cleaning, but don’t have any scratchy or protruding features. Because they are soft, your pet will still be able to feel the movement of your hand, which will keep him or her at ease, especially if he or she is skittish. These mitts are great at brushing fur and dander off your furniture too, which is always a welcome bonus! Available on Amazon for under ten dollars you may as well get one for each pet! Some gloves or mitts are more of a hand “cover” than an actual glove with separated fingers. These gloves are a really comprehensive product, which literally fit “like a glove”. They have “nodules” on the fingers and palms which gently but effectively remove clumps of loose hair. One of the best features of this product is that you can use it both wet and dry; bath-time can double as de-shedding time! Because your fingers are separately covered, you retain full dexterity, which is great for handling bathing products, taps etc. 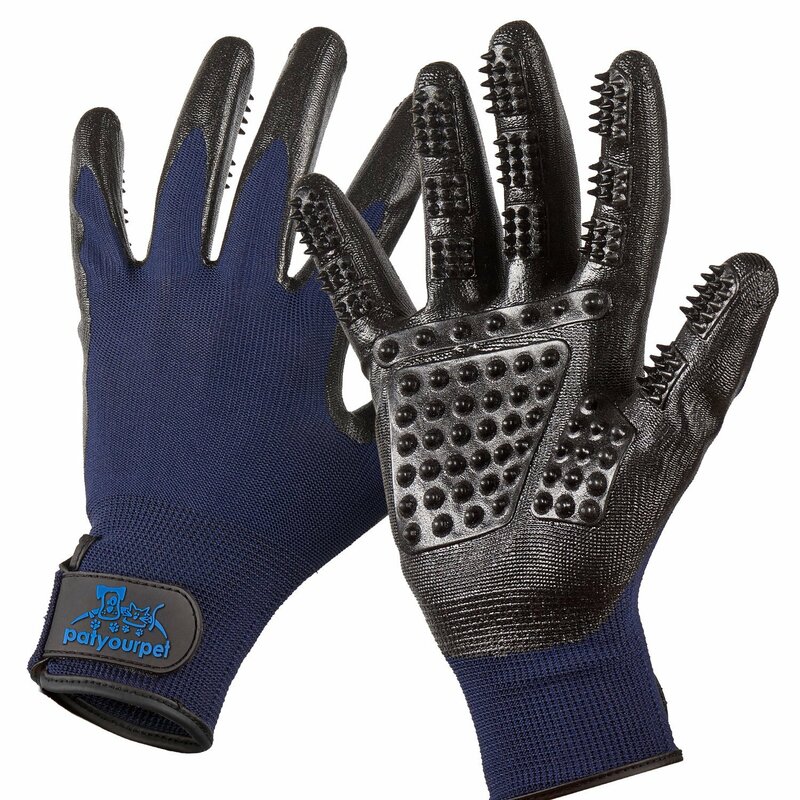 The official listing describes this glove as ‘De-Shedding Gloves for Horses/Dogs/Cats/Livestock/Small Pets’ – so as the name suggests, this is a versatile product! These gloves are a little more expensive than some other options, but the versatility does make up for the cost. 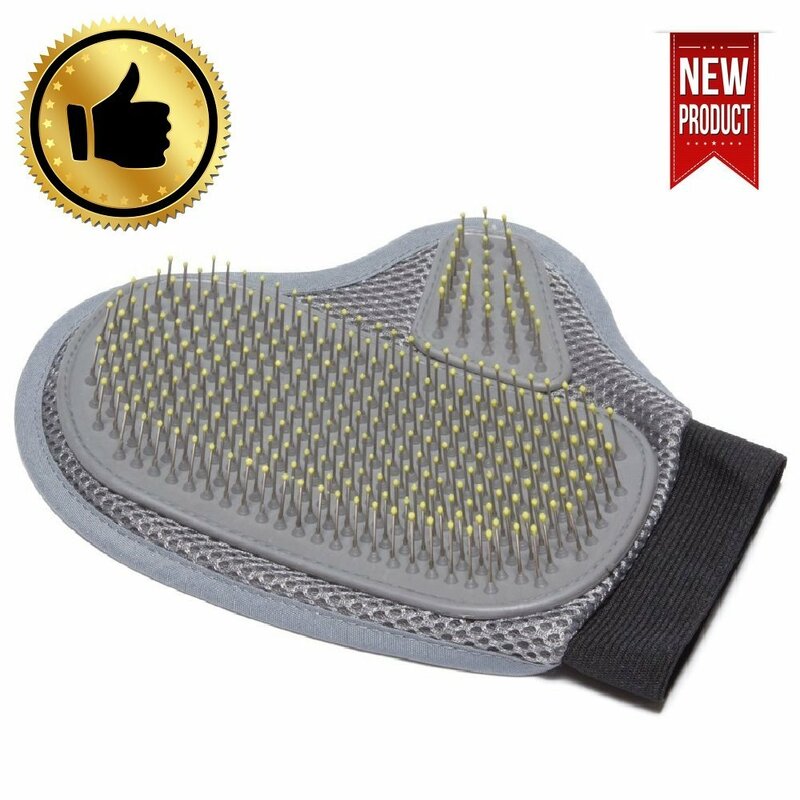 This low cost, attractive silver/grey mitt has been designed for grooming your pets and your furniture. One side has rubber-tipped “bristles” (like a comb) which gently massage your pet, capturing loose fur along the way. The new design makes it perfect for dogs and cats with long or short hair. The other side is made of hair-attracting velour fabric which whips the fur straight off your upholstery. Like the previous one, this glove can also be used wet or dry, which is great if you want to maximise washing sessions. Many pet gloves or mitts come with one glove/mitt per purchase. If you have a particularly large dog, (or horse) you might want to use both hands to massage and de-shed him, instead of just one. 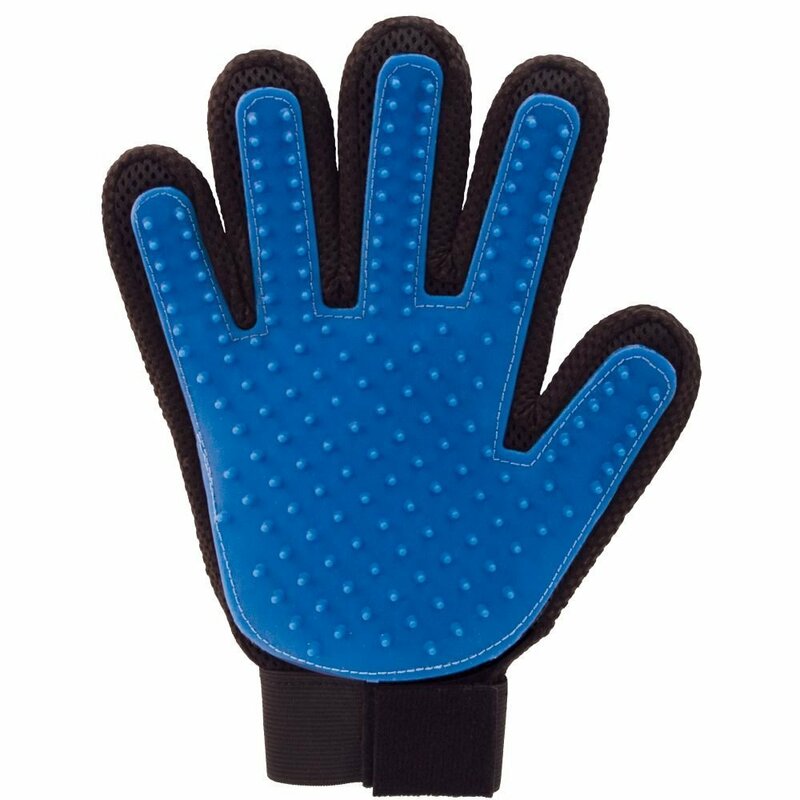 This product is ideal for such cases, as it comes with a left and right hand glove. 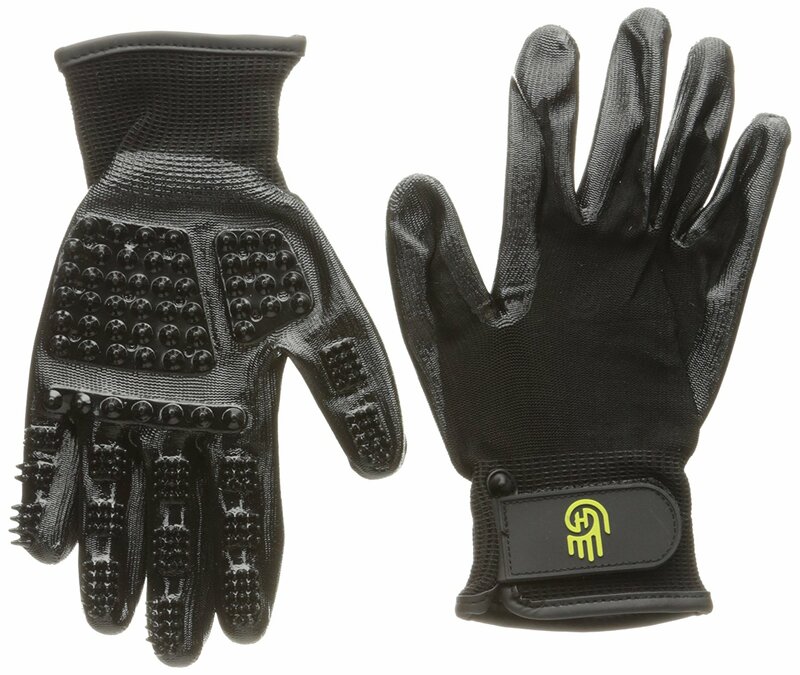 These 5-finger gloves have different-sized rubber-like tips covering the fingers and palms, which are more prominently raised than other products on the list. The higher tip makes these gloves great for more dense hairs and stubborn fluff-clusters. You can use these gloves wet or dry. Luckily, a pet hair removal glove is generally inexpensive, so you can try a few brands and styles to see which one you prefer (or more importantly, which one your pet prefers!). Pet gloves are best when they are used in addition to your normal grooming routine, and can really change your dog’s perspective on the whole grooming affair. By using the glove as often as you can, you will collect enough hair to ensure that brushing sessions are quick and painless, as matting and tangles won’t have had enough time or loose hair to form. For pets who are touchy about having their legs, ears or tummies brushed, a gentle pet glove can really set them at ease and let you gently de-shed these more difficult areas.